Private 2 BR, 1 BA Home in Woods with Lake Access. Boat dock. As you approach this private setting in the woods, you feel a calm come over you. 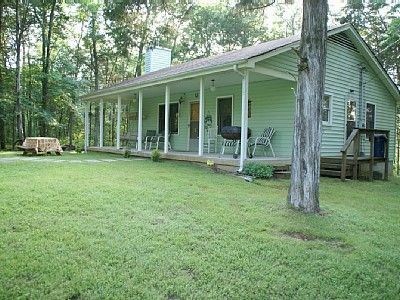 A large covered porch greets you, beckoning you to sit a spell, watch the birds, squirrels, wild turkey, peacocks and deer play in the woods. How long has it been since you've heard a whippoorwill fill the evening air? Stroll down to the lake and 'wet a line.' Boaters and fishermen love it. Back at the house, you'll find an open floor plan with a large kitchen, dining, living room area. Two bedrooms, with one queen size and one full size bed, and one bath. The kitchen is fully stocked with cooking utensils. The dining room table seats six. The sitting area has a wood burning stove to warm your toes by. Convenient to I-40 and I-840. Refrigerator with Ice-Maker, Stove, Oven, Coffeemaker, Toaster, Microwave, Cable Television, DVD/CD Player, VCR, Radio, Central Heat & Air Conditioning, Linens, Charcoal Grill, Iron, Ironing Board, Picnic Table. Bring extra towels in the summer - you’re going to want to get wet! Lebanon is the proud home of Cumberland University, the award winning Wilson County Fair, and CABA (Continental Amateur Baseball Association Tournament). Definitely a Home Away from Home! This was my 4th stay in 4 years. These cabins are clean and cozy, it's quiet and somewhat private. There are 7 homes on this road, 4 being Steve's rentals, one being his residence. I've stayed in 3 of them. A bit of a drive from Nashville where my son and daughter in law live, so it's a nice place to gather. We love the city but also love the remote location of these cabins. Steve is kind, knowledgeable of the area, makes us feel comfortable every visit. After an initial visit, he leaves us to enjoy our time. He's helped me with traffic, detours when necessary, just a phone call away. He always has the light on for our arrival, heated or cooled depending on the season. The cabins come fully stocked, you only need your clothes and food if you decide to cook (we never do, there's just too many delicious places to dine in Nashville and nearby Lebanon). Houses all have games, cards, some checkers, one has air hockey, these cabins promote family. I will never stay in a hotel when visiting Nashville, Old Hickory Lake Cabins is the place for me and mine. This cabin was the perfect size, VERY clean, and well maintained. My stay was very peaceful, and although there are several cabins on the property this one is secluded and offered woods on all sides. Deer, Turkey, Squirrels, Rabbits, and many many different types of birds were all observed during my stay. The lake is just a few paces away too. I will stay here again if in the area. Thank you so much for taking your time to write a review for the cabins. We try very hard to make your stay one that will bring you back to our cabins. Winter or summer there are the animals around for you to appreciate. Enjoy you staying with us. Lovely cabin stocked with everything you need for a great stay in Tennessee. We had a wonderful time in our home away from home and highly recommend staying here when you are visiting in the area. We enjoy making our guest have great memories of their vacation. We always strive to make the cabin completely ready except food for arrival at the cabins. We also always want to thank our guest for taking their time to write a review of the cabins so other guest can read about your visit. We look forward to having you stay again! We had a very nice stay, the cabin is clean, has all the amenity's you would need and very quiet and relaxing. Thank you so much for taking your time to give us your comments. It is always awesome meeting new people and having them enjoy the cabins, that what makes our business so great ! The Fernwood was great! It was clean, cozy, and so comfortable! Everything we needed was there. The lake and common area were just down the driveway. This is a beautiful area and Steve is a great welcoming host! It is a great time for us to be able to meet our guest and welcome them. We are so glad when our guest take their time to write their experiences on our site! We thatk you for that and we hope we will see you again soon. Directions: I-40 to Exit 238 (US 231 Exit - Lebanon / Murfreesboro / Hartsville Exit); Go towards Lebanon; Go half way around the Lebanon Square;Go out 231 North/North Cumberland; Turn left at third traffic light (Coles Ferry Pike); Go 8 miles to Cairo Bend Road North); Turn right onto Cairo Bend Road going exactly .7 of a mile;Turn right at stone columns (4145 Cairo Bend North); Continue on the gravel lane, around the curve and up the hill (the best is yet to come! ), the Fernwood House is the second cabin on the right and is nestled back in the woods. I-40 to Exit 232B (TN 109 / Gallatin Exit); Go towards Gallatin; Go through two traffic lights; Turn right at Academy Road immediately beyond the LaGuardo Recreation Center; Go approximately 5 miles; Turn left onto Cairo Bend Road North; Go exactly .7 of a mile on Cairo Bend North; Turn right at the stone columns with decorative lights (4145 Cairo Bend); Continue on the gravel lane, around the curve, up the lane; 2nd cabin on right.